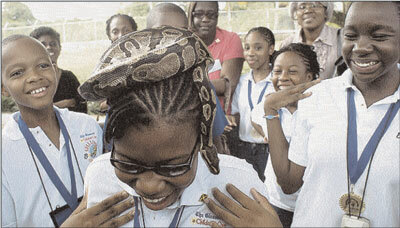 Lawre Johnson, a contestant in the Gleaner's Children's Own Spelling Bee competition, tested her courage when she had this snake placed atop her head to the amusement of her fellow competitors, Regina Bish (right) and Jahmar Brown. The students were on a tour of Guardman's Serenity Park in Spring Village, St. Catherine, on day three of the finals of the spelling competition last Thursday. Regina emerged the champion of the prestigious competition. Caption: Crowd favorite and landslide winner of the annual hairstyle contest Lawre Johnson shows off her creation "Serpent in the cornrows" to the delight of her admiring fans. Caption: "Don't WEAR the animals!" Caption: Trudi, the winner of the Gleaner's Children's Own Spelling Bee competition, is seen here at Passa Passa early Thursday morning teaching her friends how to do the "HOT WUK DANCE" with a snake on her head. Stacey to the immediate right caught the dance the fastest! Caption: "THE SPELLING SNAKE GWINE STING THE SPELLING BEE"
Caption: Lawre Johnson tries a novel method for headache relief.\"Mi try phensic, bay rum, white rum and lime, nuttin help!\", says a disconsolate Lawre. \"So de obeah man say fi try this. It no too bad but mi friends dem no want fi play wid me.\"
Caption: OH,LOOK!, a snake coming out of Lawre head! I see thats why she could spell so good. Thank you for the 63 responses we received. Enter again and we hope you will be the outright winner next time.